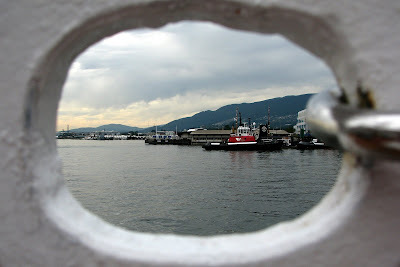 Taken June 21, 2008, aboard the Ecuadorian tall ship Buque Escuela Guayas, docked in North Vancouver, BC. Another picture from this ship can be seen in last week's WW post on my other blog, here. I'm not entirely sure that "padeye" is the right term for whatever I took this picture through. After researching ship deck parts for 20 minutes, it was the best I could come up with, and it sounds much better than "Through the thingamabob." A lovely picture beautifully framed by the hole - I think that's the technical term for it. That is really cool! Great compostition! Yo... That is nice. Great photo! I agree with Keith - The technical term is "hole"! Happy WW! And thanks for the visit! Beautiful compostition as per usual. I like through the thingamabob! More descriptive, no clue what a padeye is but love the picture. Is a padeye a padlock ..a keyhole? I'm all for thingamabob, but why not thingamajim, or thingamajoe?